A recycling plant burned in a fire in the Mott Haven section of the Bronx. MOTT HAVEN, Bronx (WABC) -- A five-alarm fire is burning through a private recycling plant in the Mott Haven section of the Bronx. Two firefighters sustained minor injuries. 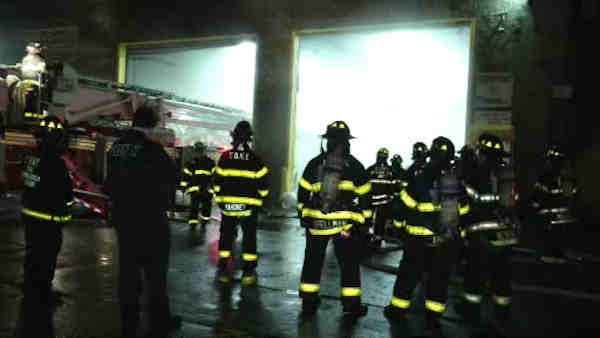 The fire broke out inside Triboro Fibers on East 135th Street just after 1 a.m. Wednesday. The recycling plant was operational when a machine inside malfunctioned and caught fire. Fire spread to large bales of garbage to be recycled. Firefighters pulled the bales apart to extinguish the blaze, and are using payloaders to put out the burning debris. The process is expected to take much of the day. After fighting the fire for six hours, they called for a fifth alarm for relief purposes. East 135th Street from Walnut Avenue to Locust Avenue, and Walnut Avenue from East 135th Street to 136th Street, are closed.